One of the most common areas of concern is how to develop consistency and accuracy in your bowling. Having a goal to developing these skills is key toward enhancing your ability to score well and raise your average. It is not uncommon to focus on all sorts of adjusting, changing balls and becoming frustrated, only to learn the better solution is to fix the root problem. You cannot be accurate until you develop consistency. The willingness to be objective and focused if you are to achieve both consistency and accuracy. First learn the trade, and then learn the tricks of trade. Accuracy is a byproduct of consistency. When the swing of your ball moves in different direction from swing to swing, or you attempt to guide the path of your ball toward your target with your arm swing, that inconsistency creates different ball paths, and results in different outcomes for each shot. This fact makes it much more difficult to be accurate. A more satisfying approach is to swing the ball in a straight line, or within a small area called a swing slot or swing plane. The swing plane is the route your ball takes as it travels from the initial point of movement through the release point and follow-through. The Swing Plane is a virtual narrow box vertically inline with the ball and perpendicular with the lane. Keeping the swing plane fresh in your mind promotes increased accuracy and body fluidity in your approach. In its simplest essence, the swing plane defines the shape of your swing. When you watch bowlers more carefully, you quickly learn that the shape of most swings are unique. Most bowlers have their unique swing path. When you watch top level athletes, you can see their swing plane, or as some call it, their swing slot. This technique is key and one of the most important factors that differentiates great bowlers from the rest of the field. Advanced players in active sports using the swing of a bowling ball, a club in golf, a baseball, basketball, or football have a great swing. They target with their eyes. 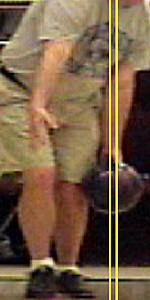 They keep their golf club, baseball bat, basketball, or bowling ball directly in line with their eye. And they also keep their eye in line with their target throughout the swing. These three components form a straight line: object, eye and target. You can see this technique as a basketball player shoots their foul shot with their eye directly behind their ball, or as a golfer swings their club and their eye is directly in line with their ball and their target. The line formed by these two points is extended toward their target. You see this technique in advanced bowlers as well. Create a consistent swing. If we cannot repeat the swing of our ball, we cannot achieve accuracy. Hit our target consistently. Since the path of the bowling ball is most often not a straight line, we still have targets, and need to reach our target accurately ball after ball. The vast majority of advanced bowlers have a pronounced lower throwing shoulder. Also, their 2nd to the last step of their approach is in front of their sliding foot. These two characteristics of those who excel in their sport are key to accurate and consistent scoring. Keeping your aim in line with the ball swing. When the ball is allowed to travel along a straight swing line, it should be apparent that enhanced accuracy will result more than would a ball that travels along a wide swing plane. The dominant eye should remain directly in line with the ball, shoulder and target. When performing your delivery, you stand a better chance of staying on-line with your target when your eye, shoulder and ball are all in alignment. As to the initial pushaway of the ball into this narrow swing plane, if the swing is to remain free from arm muscle movement that may influence the ball path away from that alignment, the body must remain clear of the ball swing. At the end of the pushaway, the ball must be allowed to free fall into the backswing after the first step of a four-step approach or second step in a five-step approach. The bowler's ball-side foot, then, must move away from that free swinging ball. 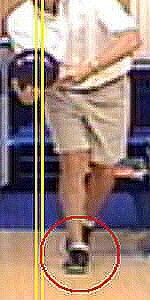 The ball-side foot is placed in line with the sliding foot as if the bowler were walking a tight rope. There are a wide variety of ball swings that loop toward the ball channel either to the front or rear of the bowler at the beginning of the ball movement. While these methodologies have merit for the advanced bowler, it is best to establish solid, narrow ball swing that results in accurate and consistent bowling. Most often, a wide ball swing plane results in an inconsistent result. Ultimately, the goal of developing a clean, narrow, well defined swing plane, increase the bowler's ability to repeat good shots and improve accuracy. 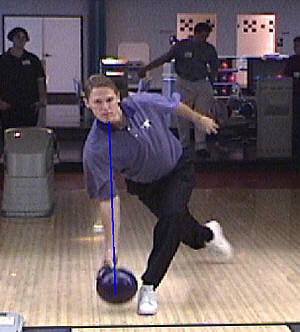 More advanced bowlers drop (lean) their ball-side shoulder down to align their eye over the ball. From the stance, through the swing and ultimately the release of the ball, the head remains over the ball. Since you eyes are focused (You are focused aren't you?) on your target, this three-point alignment creates our starting point of your ball swing. You are able to do this consistently. It is a great place to begin an ideal swing. As the ball is extended toward the target into the pushaway, the head remains over the ball. If you are to maintain a straight swing, your body needs to move out of the way of the swing. 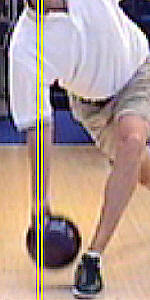 This occurs by combining the initial lean of the ball-side shoulder paired with your foot movement. The second step of a 5-step or the first of a 4-step delivery is placed directly in front of the sliding foot, as though you were walking a balance beam. This keeps the ball swing straight in line, and keeps the ball swing under the head. Once you develop this technique, your ball swing is started on a consistent, accurate swing path. As the ball freely swings back, the ball remains in the swing plane, and upward into the back swing. The wider the swing plane, the more accuracy is affected. Tighter is better. The ball swing should remain free and the arm without tension. As the ball swings downward toward the release point, the shoulder remains dropped, and the head remains over and in line with the ball swing and target. This allows the ball to remain within the swing plane into the release point. The release and follow through, the head, ball and target remain in line, and the head and ball remains within the swing plane to avoid altering the ball path. At the release, right handed bowlers will be seen with their head in the 1 O'clock position, and their trailing leg at 7 O'clock. Left handers will end with their head in the 11 O'clock position and their trailing leg at 5 O'clock position. Your approach should be in a consistent, straight line as though you were walking a balance beam. The best swing path is the one that best works for you, but must result in a consistent and accurate path. If you take any steps out of line while your ball is swinging, it will alter the swing path. Holding the ball in your non-ball side hand during the stance, and maintaining consistent gripping pressure on the ball enhance a straight ball swing. Changes in the tension in your arm or gripping pressure changes the swing path. Developing a free arm swing, and avoiding the urge to guide the ball are key factors in achieving accuracy. Again, changes in the tension in your arm changes the swing path. 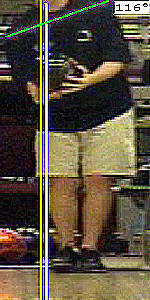 The non-bowling arm swing is meant to maintain body balance. What you do with your non-bowling arm affects body balance and the swing path. Keeping the swing plane tight involves starting in the stance with the ball-side arm positioned comfortably down at the side, with the horizontal ball position midway between the shoulder and the middle of the chest. This places the ball near the center of the stronger body muscles, and minimizes body tension. Avoid stress on the arm or shoulder by placing the ball too far inside or outside the major strength muscles since that causes stress on the arm, shoulder and back. 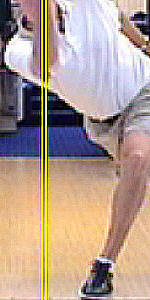 If the ball is held too far inside or outside during the stance, the swing path of the ball is altered, and requires muscle tension to bring it back into the intended swing plane. Swing the ball close to the ankle at the point of release for consistency and maximum leverage. Develop Good Timing. Early or late or timing alters your ball swing path by causing you to release the ball early or pull the ball through; either timing alters your ball path. Many variables affect the ball swing path. It is evident that having a perfectly straight ball swing would be very difficult, but in essence, the tighter the ball swing plane, the more consistently accurate you will be. To attain inner peace, you must align your vision with actions and your goals.